Mary Green takes a closer look at April’s vibrant plant life. The start of this year was cold. The National Trust publishes a list of plants in flower in the mild south-west on Valentine’s Day: this year’s was down 34 per cent on last year. But warmer weather followed, along with the daffodils, and the primroses came quite early. Cherry plum came out for half-term, as it should, but then there was a cold spell at the start of March, and blackthorn was late. Who knows what April will bring? By April, the colours of the countryside will be getting more varied. You may notice especially the arrival of blue among the yellows and whites. The flowers get more fragrant too, because the bees and insects are crucial now for pollination and the plants want to attract them. Many of the earlier flowering plants are not entirely dependent on insect pollination. The very earliest, like hazel and alder catkins in January, are wind-pollinated – hence their dangly, swinging shape. Many spring flowers are from bulbs. We have seen February full of snowdrops, and the native daffodils followed in March. Bulb flowers are gradually more coloured, scented and showy as the year goes on and the insects that pollinate them get more numerous. However, they are not reliant on insect propagation. As you know if you grow garden bulbs, they also reproduce by the bulbs dividing underground – and moving about! This dual method is one of the reasons for the success of bulbs. Another is that nearly all the native bulbs flower in spring. This means that they can survive under trees where there is shelter and good fertile soil from leaf-fall. They need to flower and set seed in the sun so have to do this before the leaves are fully grown and shading them. With the decline in native woodland many of them have survived under hedges. As they like the ground to be undisturbed, they also thrive on open ground in churchyards and the landscaped grounds of stately homes. However, by April people start mowing grass, so many of the later ones have disappeared from open ground. The later ones of course, include bluebells. I hope they will appear this month! They usually do, but if we have continuous cold weather they sometimes don’t flower till May. If you are new to the area, you may not know of the wonderful bluebell wood here: Peck Wood at Rowney Green, which only opens to the public for a week or two every year, so we can see its bluebells. Because of the unreliability of our weather, they don’t know in advance which week it will be. 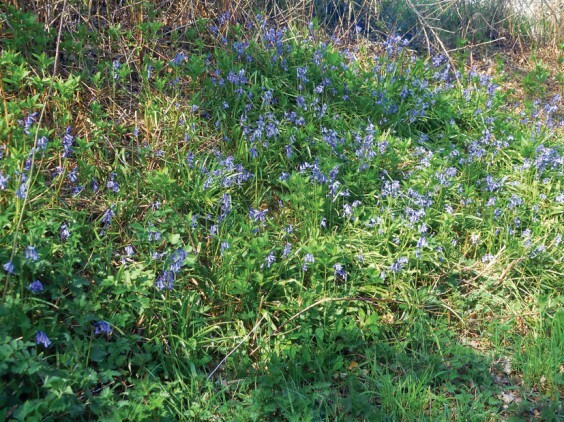 This shows that the bluebell is one of the plants particularly influenced by warmth rather than light. Many bulbs are, waiting for the temperature to be at a certain level before they flower. Bluebell bulbs need deep layers of soil. They have “contractile roots” beneath which draw them down into the moist lower layers. This explains why they don’t grow much on chalk, limestone and sandy soils, preferring acid soils or clay. Nor do they like ground which is dug and disturbed. Woods are the best places around here to see bluebells, and there are several. Peck Wood is so good because it is an old wood of mixed native deciduous trees, carefully managed so that the flowers that grow underneath are varied and successful. As well as bluebells you will see beautiful wood anemones and wood sorrel. Shortwood along the canal, Beaconwood & the Winsel and Pinfield Wood on or near the Lickeys also show how profuse bluebells must once have been in this area. And roadside banks that used to be woodland edge carry them: Scarfield Hill is lovely for its bluebells and wood anemones. Sandhills Green has bluebells and another unusual bulb called snowflake. You can see bluebells on more open ground. Coughton Court is one of the stately homes that has conserved its environment to include bluebells. And there is the Old Orchard near Barnt Green. If you don’t know this one, you find it by walking out of Barnt Green on the Blackwell Road. On the right is a little ridge with trees and a footpath (and bluebells! ), then you reach a small bridge over the railway. Over the bridge the footpath goes past a house and into the Old Orchard. As its name suggests, this has fruit trees. Because it has been left more or less untouched, it also has wonderful wild flowers, including bluebells in spring. If you go further north in Britain, you will find bluebells growing on open moorlands and lower slopes of mountainsides. In parts of Scotland, especially on islands like Mull, they are stunning. Bluebells aren’t edible, but they can be used in medicine. Traditionally they have been used as a diuretic and as a stauncher of blood, and the sap also makes a simple glue. Recently it has been suggested that they may have anti-cancer and anti-HIV properties. The chemicals in them are useful to them to deter unwanted insects and animals. The native English bluebell is a protected species, so you must never dig them up from the wild, anywhere. They are quite a dark, purplish blue, with droopy flowers, unlike the upright pale blue Spanish bluebell by which they are threatened. They also have a beautiful sweet perfume, which on a warm spring day is quite heady as you walk through them, and attracts the bees. Bluebells are especially associated with ancient oak woods. Oaks, like bluebells, respond to the weather in their leaf and flower appearance times. Their leaves come out earlier in a warm April. Usually they are well out by April 23, St George’s Day, very appropriate for a tree which has become a national symbol. Britain has far more ancient oaks than the rest of Europe put together, with more than a hundred over 1,000 years old. Ash, on the other hand, responds more to light, and generally comes out at a more regular time at the end of April or beginning of May. Oak is usually out first these days, as the springs are warmer. Like most of these old sayings, they recognise the effect of weather but have it the wrong way round: it’s about what the weather has been, not what it’s going to be. In a cold year, ash and oak come into leaf together. If you visit any of these bluebell places, especially the Old Orchard, you may also see apple blossom. Most of the other blossoming trees in April – especially pear and native cherry – are white. But apple blossom is a mixture of white and red, making them look pink. They are very dependent on insect pollination and a good place to look out for bees. I am looking forward to seeing the old apple trees blossom again at the Lime Kilns site in Tardebigge. Here the local Canal Society has got together with local woodsman Dave Ward to coppice a big hazel hedge. This will allow it to grow back and eventually be laid properly. There should be much more light on the apple trees there this year, so the fruit should be even better than last year. I am leading an Alvechurch Village Society wildlife walk through the Tardebigge area on the first Sunday in April. Talking of walking, I notice that the local Canal Society has put up notices suggesting “dog etiquette” for people walking the towpaths. It suggests you keep your dog close to you, if necessary on a lead, and don’t let it approach other dogs unless you ask their owners if that’s OK. Some dog owners need to think also about other walkers on narrow paths. I have been asked about walking on roads, especially with a group. Some people think you must always walk on the right-hand side, but this is just the default, all else being equal. You need to walk where the traffic on your side of the road can see you best. So, going round a bend, always walk on the outside, as traffic on the inside will not be able to see you round the corner. Similarly, walk on the left going up to a blind summit like a canal bridge, then cross over and walk down on the right. And, of course, walk on the side with the best verge if there is one. When you drive, look out for walkers. They don’t always have it easy on our paths and roads, but it is one of the best kinds of exercise and the only way to see the detail of the countryside. Bluebells aren’t the only blues at this time. Their near relative, the little scylla, is out too, though usually spreading from gardens around here. Forget-me-nots are very common, growing along paths and in empty spaces in gardens. They can also be pinkish or even a mixture of blue and pink. One of their relatives is the alkanet. This is a big rough plant with small deep blue flowers, with a very long flowering season. Ground ivy is another blue April flower, not so well-known. It is the earliest plant in the sage family with bluish-purple flowers, beloved of bees and butterflies. It’s an old herb, used to make a medicinal tea. There are many different varieties of blue speedwell, too, the most common being germander speedwell and Persian speedwell. These have beautifully clear bright blue flowers on creeping stems. They grow on path sides and seem to have an appropriate affinity with gravestones! And later in the month you may find the lovely bugle, an intense blue. April blue flowers fit well with the blue skies and showers for which the month is known. Of course, the background is still white on green like all spring: cherry blossom, wood anemones, cow parsley, stitchwort, late blackthorn and sometimes early hawthorn filling the hedges and banks with white. Violets come in both colours, bluish-purple and white, sometimes with very sweet scent. There are also splashes of other colours: pink herb Robert, maroon chequered fritillaries, and red campion. It is the time when you begin to see young birds in the hedges, and on the canals yellow and brown ducklings. The world is getting colourful! The poem is one that I wrote last April, when I walked to Peck Wood. But no may blossom. Spring though. Alone, lost, swimming too near herons. All want to help it, but spring takes its own way. Trying again to make today the day.